Whatever model devices are there, it will be available for the selection. Once it is selected, write destination number and body and send the SMS. 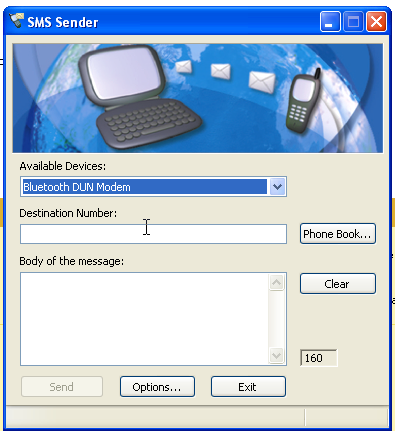 If you device ( Phone) is connected to the bluetooth, SMS will be delivered from your phone. Currently I believe only Nokia and Sony is supported by this application. I haven’t tested on other Phone. The main thing is that, this application also support COMMAND LINE INTERFACE. So that you can use this application in your code to send the SMS through some port or bluetooth. wow!!!. Following are the command line option to send the SMS.